No more compromising on tone over effects (or vise versa) and an end to jumping from FX pedal to FX pedal when your solo kicks in! Comprising the two channel Haze40 and Haze15, the series offers a rugged, gig-ready 40 Watt combo and a peerless 15 Watt head respectively. Combined with MHZ112A and MHZ112B speaker cabs, the Haze15 becomes the epitome of guitar amplification - a valve-driven Marshall stack, but one that fits easily into either the lounge or boot of the car. Marshall 1936 Speaker Cabinet....Small But Packs A Rockin, Full Fisted Punch ! The Marshall 1936 is a smaller Mono / Stereo 2x12" cabinet is ideal for use with stereo rack systems. The compact, 150 Watt Marshall 1936 is perfect as an extension cabinet for your combo amp but dont let size fool you it can also handle a full-sized amp head. Need a portable, compact half-stack? The 1936 is your answer ! 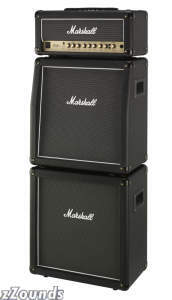 Key Features Of The Marshall 1936 Speaker Cabinet: Speaker: Celestion G12T-75W 2 X 12" 150 Watt Selectable Mono/Stereo. 16 Ohm, 8 Ohm. Black grille cloth, white piping. Large white logo. Black elephant grain vinyl.